Flying under the radar amid a flurry of announcements from today’s Google I/O developer conference is the bigger news of how Google is stepping up its efforts to compete with online payment giants, such as PayPal. It plans to do so with a revamped checkout process for the web, mobile web, within mobile applications running on Android, and more. It’s a proposed death to PayPal by a thousand cuts, leveraging everything from Chrome to Android and even Gmail. What Google hasn’t quite worked out yet is how all this will tie together in the long run, but you can see the plan beginning to form. Let’s start with the browser, the de facto home for online shopping. It’s not news that the checkout experience is broken. Shopping cart abandonment is one of the biggest pain points for today’s merchants, mainly because their websites have traditionally offered only cumbersome and tedious forms for shoppers to fill out in order to make a purchase. As noted during today’s keynote, one of the hardest things you can do on the web is try to buy something. The process takes around 21 steps, the company explained. Of course, Google is exaggerating here a bit – billing and shipping details are usually the same, but Google counted each field (street, ZIP, etc.) twice. That being said, things are even worse on mobile. Google notes that shopping cart abandonment on mobile devices is now an outrageous 97 percent. Again, that seems high (here’s the source for that figure), but the trend Google is illustrating with these slightly puffed up figures is not. For comparison’s sake, Monetate’s data put global cart abandonment at around 82 percent as of Q4 2012. The company has been seeing increases in cart abandonment – which had been around 60 percent over the past several years – due to an increased number of shoppers doing research on mobile phones and other devices. As they reach the point of checking out on mobile, they’re now more likely to give up and move on because of the increased difficulty of the experience on mobile’s small screen, combined with retailers’ failure to roll out mobile-optimized experiences even as percentages of mobile shoppers continue to grow at record rates. A number of startups have been attacking this challenge in various forms – mobile apps featuring universal carts, native m-commerce storefronts, mobile optimized payment flows, one-click mobile payments, in-stream payments, and more. Chrome is already the world’s most popular browser, with more than 750 million monthly active users today, up from 450 million just a year ago. Now it will begin baking a speedier checkout experience into its browser by syncing your billing information and other details within Chrome. What that means is that when you visit a website using the Chrome browser, including the Chrome mobile browser, you’ll automatically be offered a prompt with your billing profiles. Chrome can then use autocomplete functionality to fill in information for you, such as your address, ZIP code, credit card info and more. Google says this decreases the number of steps in the checkout process from 21 to just 3. Overall, it’s a worthy attempt at solving the problem with online checkout, but it still suffers from some potential obstacles to broader adoption: Website owners will have to implement the functionality (the API) on their end, and unless this “aspiring” web standard becomes an “actual” web standard supported by all browsers, its impact would be limited. While the above describes what will first be a Chrome-only feature to start, Google Wallet has already found a way to support the web and mobile web through more traditional means. In addition to supporting online checkout through Wallet, last fall, the company launched a Google Wallet API, which allows e-commerce website owners to support checkout via Google Wallet on mobile devices. This is independent of the browser or mobile operating system, however, making it more like an alternative to the PayPal button. It’s a bit confusing because with the new Chrome autocomplete functionality, it seems there will be some overlap between the two. Site owners would end up implementing two APIs to be fully supportive of Google users: one to speed up checkout through automated form-filling in Chrome (likely pulling payment credentials from a user’s Google Wallet), and another if they wanted a Google Wallet button on their site that users could click to instead be walked through the Google Wallet checkout flow. Which is better? How will these two tie together? For now, Google can’t say, only noting that it’s still “early days” for the Chrome autocomplete API and it’s probable that Google Wallet will be supported in some way. But nothing is definite yet. It’s indicative of how Google needs to bring its separate teams together in order to tell a more cohesive story about payments. Rumor has it that the Wallet team has been too “siloed,” which has caused some issues. (See part #5 below, for example). Android is the world’s most popular mobile operating system, so it only makes sense for Google to take advantage of that fact to pull in more users’ payment information. After all, today’s users are already using Google Wallet to purchase paid applications for Android devices, as well as in-app purchases, so why not extend Wallet to support purchases of physical goods, too? That’s just what Google did. With the new Google Wallet Instant Buy Android API, merchants and developers selling physical goods and services (as opposed to virtual goods like those sold in mobile games), can now offer their customers 2-click checkout. At launch, the company has signed on a number of new partners, including Airbnb, Booking.com, Expedia, Fancy, GoPago live POS, NFC Task Launcher, Priceline, Rue La La, Tabbedout, Uber and Wrapp. The service ties in also with Google+, allowing users to register and sign in to the apps, similar to Facebook Connect, and then tap to checkout without the need to enter billing or shipping information. Another vector in the fight to topple PayPal is person-to-person payments – like paying the babysitter or paying your dad the money you borrowed, for example. Digitally savvy folks today still largely turn to PayPal to make this happen. Google’s plan here? Leverage Gmail. It’s simple and ingenious really. 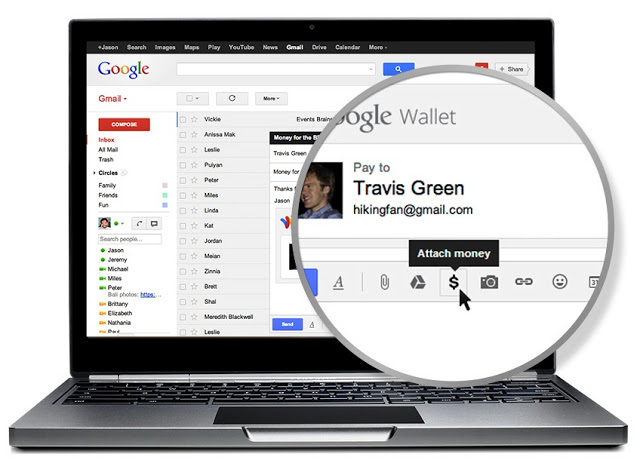 The familiar email “attachment” icon has just become another onboarding experience for Google Wallet. With the Gmail update, the service’s 425 million+ users can hover over the attachment paperclip icon, then click the $ icon in order to “attach money” to their message. Of course you’ll need a Google Wallet account first. For now, the feature is only available in the desktop version of Gmail, but it will certainly come to mobile in time. The only area where Google is lacking a solid strategy is in real-world payments – an area where competitor PayPal has been ramping up quickly in recent months. PayPal has been working with nearly two-dozen nationwide retail chains, including Home Depot, Jamba Juice and more, to be integrated into their point-of-sale systems. It has separately announced integrations with point-of-sale and hardware makers like NCR, gas station and convenience store-focused Gilbarco Veeder-Root’s point-of-sale system, coin-counting kiosk maker Coinstar, and more. Google has been trudging along with its NFC-based Google Wallet app. The app uses technology whose broader adoption has been slow to pick up here in the U.S., in part due to a lack of support from Apple, as well as swirling questions as to how much of an improvement tapping your phone at point-of-sale really has over a card swipe in the long run. Google had plans to launch a plastic “universal” credit card that would allow users to switch between their preferred payment methods on the fly while still using a physical card at point-of-sale. For whatever reason, the company scrapped those plans just ahead of Google I/O. Combined, all of the above areas on their own can’t be considered a PayPal killer by any means. But as they become more tightly integrated over time (assuming Google can get its teams together to focus on the bigger picture beyond their own product’s development and focus on the global stage), you can see a viable threat to PayPal starting to shape up.